​Welcome to my website. I strive to make YOU look your best with professionally designed logos, brochures and any other marketing material that your business might need. Please email me or call me with general questions, or anything specific pertaining to your project. I am here for you and eager to get started on your great new look! ​I specialize in anything printed (that means I don't do websites). Everybody needs good-looking, well-designed marketing materials: business cards, brochures, sell sheets, coupons, and everything else. I have connections to high-format printers and high-volume offset printing, but I also offer small minimums. Just ask! I will respond to your request within 24 hours! My portfolio includes projects for small businesses, individuals, as well as for large companies. I have designed tags and labels for Walmart and Lowe's, magazine ads and signage for local realtors, POP displays and window graphics for Downtown Disney, and various projects for signage companies in the Central Florida area. My gallery showcases a small selection of my projects. With my extensive and long experience in various industries, I am able to come up with the best solution for your unique project. I will always communicate with you to see what direction you are heading, and find the most cost-effective and optimum way to turn your vision into print. I am mobile and will always return your calls promptly and/or email you back in a timely, concise and straight-forward manner. No guessing, no waiting and wondering. If you need just digital files, or a whole marketing line, I am here for you with the correct files and an end product that is geared towards you and your business. You can print the files I provide to you on your own desktop printer, or rely on my various connections with local and cost-efficient printers to get the best-looking printed material at a great price. I always provide free quotes. Layouts and Ideas for any kind of signage: Pylon, Monument, Banners, Channel Letters, etc. Flat or Trifold Brochures: full color both sides, AQ coating, delivered. 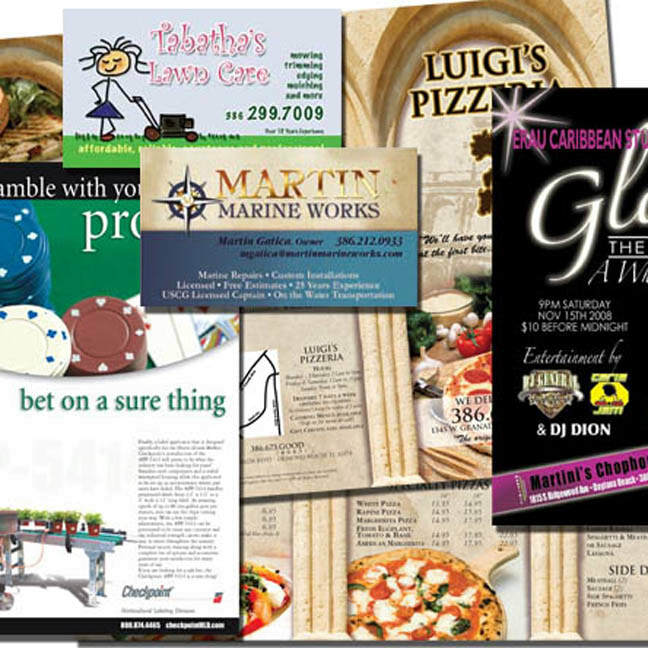 ​Postcards: full color both sides, heavy card stock, AQ coating, delivered. Ask me about EDDM marketing campaigns! Don't see what you need? Just ask for a custom quote!